A writer, cartoonist and illustrator, Bony Thomas was born and brought up in Ponnarimangalam in Ponjikkara island near Cochin Port, Kerala. One of the founding members of the Kochi Biennale Foundation, organizer of ‘Kochi Muziris Biennale’, Bony is also the author of ‘Kochikkaar’ (Kochites), a book exploring the intangible heritage of the various linguistic communities in Fort Kochi and Mattancherry. He has worked as a senior cartoonist in New Delhi and Mumbai with The Economic Times, and has also published his collection of short stories ‘Dog space’. Simon D’Silva, a boa builder from Ponjikkara, talks about the processes he follows in boatbuilding. K.A. Johnson, who has 34 years of experience in the field, speaks about his family’s association with boatbuilding; Kochi, 2017. I began doing carpentry when I was just 12 years old. Traditionally, all the men in my family have been boatbuilders. My great-grandfathers also practised this profession. We have been building vallams (traditional wooden boats), houseboats, and other kinds of boats for years. My grandfather, Enasi D’Silva, worked with the Madurai Company, Kochi, which was owned by an Englishman. When he died, my father, Clement D’Silva, was only 12 years old. The owner of the company was ready to train him, but my father, being the only son, preferred to learn the work his father did. I dreamt of building boats even as a child—I would make small toy boats and even sell them sometimes. However, I could not continue my schooling due to financial difficulties at home; I studied only up to Class 5. My father advised me not to enter the boatbuilding trade, so I tried different lines of work—however, I was eventually destined to become a boatbuilder. I am satisfied with this job. I have built more than 300 boats now, including passenger boats, throughout Kerala and fishing boats in different parts of Tamil Nadu, Odisha, and Gujarat. My father is my guru—I learned the craft from him. Merseli D’Silva, who happened to be my father’s friend, was my ashaan (teacher). I was his only disciple. He was born on this island and lived near the Anglo-Indian school. He is no more now. I worked with him for many years. Later on, he worked with my firm too. He loved me very much, and he loved working with me. I do all work related to boatbuilding and repairing. It takes specialised skills to bring a boat in need of repair from the water to the yard and then to take it back. Other boatbuilders usually contract this work to labourers, but I do this work myself. I imagine the entire structure of the boat in my mind. I have seen others make sketches and calculations and yet create faulty boats due to miscalculations. The structure of tourist and passenger boats are entirely different from that of fishing boats. Fishing boats go into the sea, while the others are designed for the backwaters. The width of the palla (middle portion) of tourist and passenger boats should be spacious for better balance and safety. However, fishing boats meet with powerful waves and fathoms of water, so they must be constructed to survive at sea. Along with my father and grandfather, my brother was also in this trade for some time, but he had to leave due to ill health. My first cousin, now in Edakochi, is also in this profession. There are many Anglo-Indians, Latin Catholics, and some Hindus engaged in boatbuilding. It has been a traditional practice since the time of Vasco da Gama, which is why I think so many Anglo-Indians practise it. When someone contracts me to build a boat, I imagine its design in my mind. Then I purchase wood from which we make the eraavu (the centre piece on which the entire frame of a wooden boat is built, forming the backbone of the structure). The process continues with the making of kuthukatta (the base or stand on which the boat is built), palam vekkal (process of arranging the wooden planks horizontally on the frame, in between the kombu to maintain the balance and distance between kombu on either sides of the boat), kombu vekkal (process of arranging the wooden planks vertically on the frame), mattom vekkal (‘mattom’ means measurement; mattom vekkal is the process of balancing the measurements so as to maintain the boat’s buoyancy), palaka chaaral (‘palaka’ means wooden planks; palaka chaaral is the process of filling in wooden planks on the body of the boat), manikkaal paniyal (process of building the vertical pillar for the upper portion of the boat, joining the base and the full frame of the boat), thara paniyal (process of filling in the gap between the wooden planks to prevent seepage of water) etc. Then, there is the megiri chaaral (process of tightening the wooden planks in four layers using a wooden plank that runs horizontally across the full frame of the boat). The process goes on with different steps like thattumegiri (the layer on floor level), keezhmegiri (the lowest layer), waterline megiri (the waterline layer on which the boat sits), and theermegiri (the top most layer above the thattumegiri). Then comes cover moodu (an entrance to the basement of the boat) and valka (the door portion), followed by the making of the thattu, on which the cabin is constructed. The design of the cabin varies according to the function of the boat. To bring the boat onto the land, we use different kinds of equipment, like valoos (wooden planks in between the rails that helps to keep the rails steady), urul (a cylindrical wooden piece laid on the rail which, on rolling, would move the boat ahead), rail (a wooden rail), kappi, rope, and chakku (the boat is tied to a rope which is connected to the chakku in such a way that the boat moves ahead on urul as the chakku is turned). We also use the ambayidal, a kind of rhythmic and musical oral command. During ambayidal, we use the command other to pause work and aves to resume. Ariya is used to slow down while taking the boat into the water. Earlier, there were a variety of uli (chisels), chintherus (a tool used to smoothen the wood), birmas (a hand drill), saws, and other tools used in carpentry. Now we use machines like drills, grinders, and cutters. Traditional tools, now considered obsolete, are rarely used. Anjili was the preferred wood, especially when it came to fishing boats. Even today, wooden fishing boats are made of anjili, but most are made of metal. Due to the scarcity and rising cost of wood, tourist boats are increasingly made out of fibre, which is more durable; wood is now used only minimally. Wooden parts are not maintained properly, possibly because everyone only wants to make profits nowadays. Apart from boats, I also build traditional vanchis and valloms (the former is a small traditional wooden boat whereas the latter is a bigger version of the same). Their dimensions are measured in kolu (1 kolu = 3 feet). Many valloms have now been converted into houseboats. New builders have begun recruiting engineers to draw designs. When I started work, there was no scope in that line of work; I still draw my designs myself. Still, everything has worked out well for me thus far. Machines and electrical tools have sped up the boatbuilding process. On this island alone, there are about 150 people engaged in this profession; 60 percent of them may be Anglo-Indians, 30 percent Latin Catholics, and the rest, people from other communities. There are four or five yards on the island, with about 10 mestris (a master or teacher) who also contract work from outside. I have been in this trade for the last 34 years. I discontinued my schooling after Class 8 and joined my father, a boatbuilder, in the boatyard. His name was Antony; people called him Anthappan Mestri. My mother’s brother, Joseph, was also in the boatbuilding trade; my paternal grandfather, Xavier, was a boatbuilder too. In those times, there weren’t boats exactly, but thonis (rowboats), or chilankas, as they were called. The thonis were used to transport goods from ships anchored at sea, as well as from barges. My father did not make any sketches before building a boat, but these days, drawings are a must. He did not own a yard. 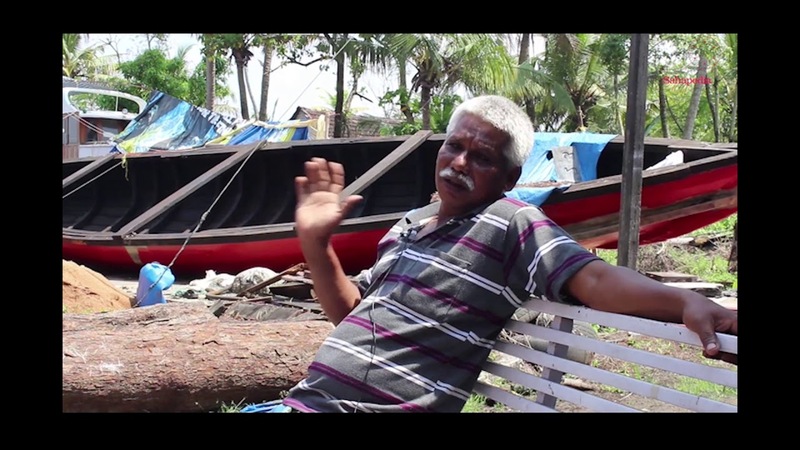 Whenever he was contracted for work, he would find a space near the backwaters of Ponjikkara and build boats there. Though several people we engaged in boatbuilding on the island of Ponjikkara, I remember seeing only two permanent yards there during my childhood; they were owned by the Chambady and the Kannampilly families. For my father, who was totally immersed in the craft, boatbuilding was an art with a lot of mirth. In those days, boatbuilders worked from dawn to dusk; their only aim was to get the boat into the backwaters. The final shape and design of the boat was conceived in their minds—it was really daring. Recently, when I told my friend—a French boatbuilder—about this, he was very surprised. He said he could not imagine hammering even one nail without a pre-planned sketch of the boat. I did not have the opportunity to work with my grandfather; I learned this work from my father, who had learned it from his father. The skill has been passed down through generations—it is a tradition. Today I draw a design before building a boat, but neither my father, nor anyone else from those days, did. Theirs was a totally different experience. My father built almost 75 percent of the boats—tourist boats—used in the port those days. He also built fishing boats which were not very big. They were made of wood, not fibreglass or metal. There are four major stages in boatbuilding. The first one is carpentry. Indeed, one’s success as a boatbuilder relies on one’s skill in carpentry. The second is kalpathy pani, which involves fixing cotton to wooden planks to prevent water from seeping into the boat. The third stage is engine work and the fourth is painting. I worked in the carpentry stage. It is scary to think that we used only handmade tools and no electric tools. For instance, we used a tool named birma to drill thousands of holes into the wooden planks. There were specialised, skilled workers who made the birma. As a beginner, I started with the work of drilling these holes in the planks. As everything was done manually, even making a hole involved 10–15 minutes of labour. Then there was chintheru thallal, the smoothening or planing of wooden planks. We would also cut wooden planks out of thaludam—a big piece of wood—using a handsaw. We even drew the shape of particular parts of the boat on the thaludam and then cut them out with the handsaw; this required much skill. In those days, the mestri played an important role in boatbuilding; he was highly respected. I remember Pediro Mestri, Ousepkutti Mestri, George Mestri, and Poopoo Mestri, to name a few. With time and experience, a labourer who is smart enough to learn the skills involved becomes a mestri. That is how I became one. There were specific tools for different work. For example, the ogar—a bigger version of the birma—was used to drill bigger holes. There were also different versions of the chinther (saw and chisel). Sundays were dedicated to visiting the blacksmith, who would make new tools and repair old ones. My courage to build boats comes from my past experience. I think it is a blessing to be able to imagine the structure of a whole boat before sketching it on paper. The first boat I made independently was a wooden tourist boat. Generally, we use wood like anjily, teak, irumullu, thambakam, and punna in boatbuilding. The wood must be carved out. This is done by coating it with neem oil and then boiling it. A paste made of animal fat (mostly from cows), neem oil, thelli (a tree from whose sap a glue mix is made for water proofing), and chalk powder is applied to the planks to prevent water from seeping inside. The wood, which is selected to suit the shape of the boat, is sometimes purchased from other places. The previous generation depended solely on traditional methods. They were reluctant to use modern technology and cheaper materials like fibreglass and plywood. I was the first on the island to use fibreglass in boatbuilding I am comfortable with both wood and fibreglass. So far, I have built about 40 fibreglass boats. In 2002, I built my first fibreglass houseboat, which won an award in an international boat show held at Bolgatty, Kochi in the year 2002. Fibreglass boatbuilding is more profitable as it needs less labour; it is also more durable. Apart from houseboats, I have also built speedboats and urus (a big wooden ship made in Beypore, a village south of Kozhikode, Kerala, considered to have connection to Arabic tradition) out of fibreglass. Now, I also build catamarans. Fibreglass boats form 60 per cent of my current business. Even my wooden boats contain 10–15 per cent fibreglass parts. I have designed floating buildings that can be used as residences, tea shops, or offices. I am trying to make boats that are cheaper but of a better quality. Apart from this yard on Ponjikkara Island, I run a bigger boatyard on Vypin Island, where I build catamarans. I work not only here, but also in Assam.